The service is been very good. We have used Poop911 for over 5 years. They are dependable and thorough. Their service is a worthwhile investment. I love this service and company! They are timely, professional and always doing a great job cleaning my yard. It’s so nice to have my few time back, I would definitely recommend Poop911 for your pet needs! Thank you for the wonderful words! Best service ever! Michael and his team are responsive and efficient. We recommend this timesaver to everyone! Love having a clean yard! Such an awesome time saver. They are always prompt and never miss a service day. They do a fantastic job that no one else likes to do. Our poop911 guy is AMAZING!!! We truly appreciate the service he gives and he is always accommodating!! 100% satisfied. Thank you and Thank you, again! I have 2 dogs and it is wonderful that I get to spend time with them and not worry about the mess. I get to enjoy without the work. It would be nice to know sooner if they were coming on different days. Professional and just down right real. Good team here in Boise. Service is always quick and thorough. I love having a clean, good smelling, and enjoyable yard all the time. I also appreciate that the gate is always latched securely upon leaving. Overall, very reliable service and an excellent value. Highly recommended! I've used this service for several years and am entirely satisfied. Thank you for sticking with us!! Always great, no complaints. The person who services our yard is professional and timely. The individual who operates the business is always easy to talk to and very helpful. Thank You, Jaymie! It's a pleasure to serve you! We are very happy with our service. Came out as scheduled. Very thorough job and kept gate secure. Very happy. They are great! Neat and clean. Our service person is friendly, personable and respectful of our property. He calls me by name as well as my dogs if they are out when he comes. My dogs don’t bark and are not at all stressed by him which is really saying something. It's a pleasure to be of service! Thank you! Such a great service! They are always on time and I never have to worry about my yard being clean. They do a great job every time! Wish I would have done this along time ago! They come on schedule and do a neat job. Customer service is also very responsive. Wonderful to be of Service! Thank you! Flexible, quick, and informative of the work done. This is a great service and the people are very friendly and they do excellent job. 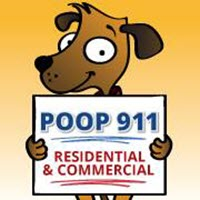 I broke my back a few years ago and bending over hurts, poop911 has help me keep my pets. Thanks. Great service. Easy use of website to change or update information. Michael has always been extremly accommodating and thorough. I very much appreciate the service as well as the customer service!!! They are amazing! Very professional. Thank you! It's a pleasure to be of service!! Love you guys! So does my dog! Love that you LOVE it! !